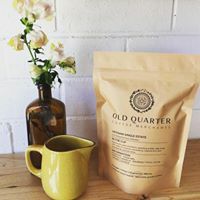 Old Quarter is serving quality coffee with a difference. Quality starts with the growing partners who tire year round to ensure the best harvest possible. Each bean is picked by hand in the fertile, high altitude growing regions of South East Asia and selected carefully to ensure a superior raw product. It's processed with exceptional care. The coffee is then roasted at their Ballina store in small-batches to provide the freshest coffee available. The coffee sold and served at Old Quarter is 100% traceable, sustainable, world changing coffee. It is coffee you can feel awesome about buying.